Developed as early as the fourth century, this Ethiopian binding style has withstood the test of time. The elegant sewing structure, combined with wooden covers, opens a wide range of possibilities for both the beginner and the advanced bookbinder. Using simple hand tools, you will drill, shape, and smooth your book covers. Finishing includes sealing your wooden covers with milk paint and a coating of wax as well as adding a leather closure. As time allows, Daniel will share various features he includes in his own bindings and sculptural books. 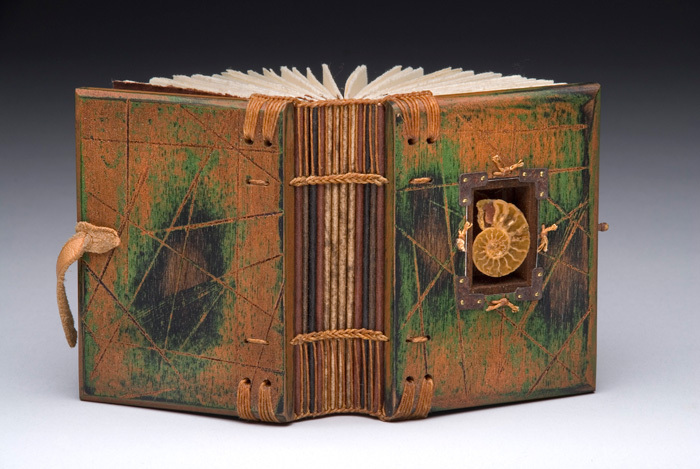 Many of Daniel’s books are featured in the Penland Book of Handmade Books. All tools are available for workshop use as part of the Scheduled Private Workshop fee. Please feel free to bring your own tools if you wish. Pencils: wood, mechanical, white colored. Wood covers, text blocks, handmade paper, mica, assorted waxed linen thread, needles, drill bits, wax, sandpaper, steel wool, assorted milk paint colors, and other materials needed to complete the projects.